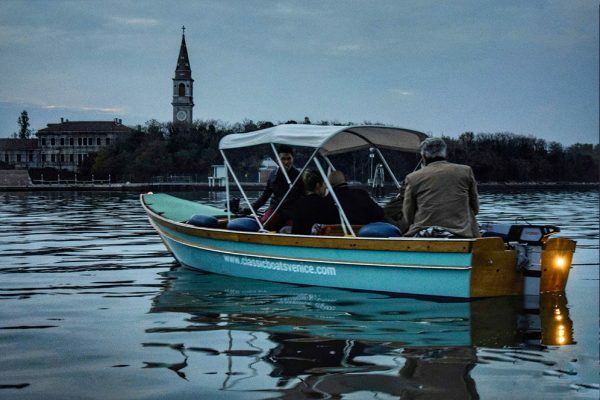 The Tour: From Certosa, you will be led by your tour guide on a traditional Venetian boat, first to Lazzaretto Vecchio and then to Poveglia. Stops and sightseeing: Lazzaretto Vecchio (30 minutes visit), Poveglia (1 hour stay). Time: 16:00 PM – 19:00 PM. Price: 450.00 (Flat Fee, Maximum 5 persons). it became a part of Venetian history. From Certosa, you will be led by your tour guide on a traditional Venetian boat. Your guide will explain to you the cultural history of the Lazzaretto and how it became a part of Venetian history. to nurse patients during the plague epidemics. one of the most tragic episodes in Venice’s history. Your first stop will be Lazzaretto Vecchio, originally the site for a hospital from the 15th century until the 17th century to nurse patients during the plague epidemics. the real historical truth about this fascinating island. until the residents ultimately fled due to war. to treat those suffering from the plague and other diseases. From Poveglia your journey will finish in Certosa. and tragedies that make Venice today what she is. Next your guide will drive you slowly around the island of Poveglia. (1hour) This island has been the subject of many speculations and myths, but our guide will offer you the real historical truth about this fascinating island. The island was originally settled in the 421 and over 800 years people lived there in peace until the residents ultimately fled due to war. Like Lazzaretto Vecchio, but much later on during the plague the island was used as a hospital to treat those suffering from the plague and other diseases. From Poveglia your journey will finish in Certosa. These islands have a long history forever connected with the joys and tragedies that make Venice today what she is.